Premier League: Was Sunday a pivotal day in the title race? Arsenal's late win against Leicester City closed the gap on the Premier League leaders to two points - then Tottenham turned up the pressure a notch by moving second with victory at Manchester City. This could be seen as a pivotal weekend in the title pursuit and certainly for the top four, with a six-point gap between Manchester City in fourth and fifth-placed Manchester United, despite a second successive home defeat for Manuel Pellegrini's side. So is the top four now a closed shop, especially given United manager Louis van Gaal's admission that the Europa League is their best chance of reaching the Champions League? And what shape are the top four currently in? Form: The Foxes were seconds away from a point that would have seemed like a victory at Arsenal - achieved with a numerical disadvantage after Danny Simpson's sending off and would have completed a haul of four points from away fixtures against the Gunners and Manchester City. Instead, Danny Welbeck's late winner changed the landscape but, as Foxes manager Claudio Ranieri pointed out, if they had said before they would pick up two points from those games that would have looked good. We have seen the brilliance of Jamie Vardy and Riyad Mahrez, but Sunday was a day that demonstrated they can dig in and have character and guts all over the field, with midfield man N'Golo Kante and keeper Kasper Schmeichel outstanding. Six points from a home game against Liverpool and these two tough away fixtures is an excellent tally and, despite the loss, there was nothing at Arsenal to suggest they cannot recover. Momentum: Still plenty and when they face Norwich City next at the King Power Stadium in front of their own fervent fans, you would back them to get back to winning ways. Fixtures are also acceptable too - they have already played their six fixtures against the other teams in the top four and have a return of eight points. Momentum still intact and nothing to fear in the weeks ahead. X Factor? X Factors for and against here. Who knows how Leicester will react to a painful defeat, or the growing recognition that they can no longer hide beneath the radar or play down their chances? And of course there is always the worry of injuries (longer-term at least) to Vardy, Mahrez or Kante. These are the unknowns - but even in defeat at Arsenal this was a Leicester City team that was rich in strength and team spirit. They play without fear and it will serve them well. Statistically speaking: Leicester City have lost just three Premier League games this season, but two of those have come against Arsenal. Verdict: Leicester City are still top by two points, have favourable looking fixtures and their players will come back refreshed after a week's holiday given as a reward for their efforts by Ranieri. The pressure will increase now but they have shown nothing to suggest they are going away - Leicester City will be in this until the end. Form: Outstanding - and backed up by a real statement of a victory at Manchester City. The doubters, many of them Spurs fans, always look for the soft underbelly, the weakness at the pinch point - not on Sunday at the Etihad. Yes, they carried luck with the penalty decision but they also showed strength of character to come back and secure the win after Manchester City's equaliser. This is the sign of a strong team going places. Listen: Ramon Vega - "I have no doubts Spurs will grab the league"
Big players such as Harry Kane and Christian Eriksen are performing, as well as the outstanding Dele Alli - but in so many respects the key figure at Spurs is manager Mauricio Pochettino. The 43-year-old Argentine, in his second season at White Hart Lane, has this Spurs team playing exactly as he wants them. They pressurise opponents, look so solid at the back and have players who can make a difference in attacking positions. Looking the full package. Spurs have the best defensive record in the Premier League, conceding only 20, and are third in the goal charts, behind Leicester and Manchester City who have 48, with 47. Momentum: Will pick up with that win at Manchester City - and that is five league wins in a row since they lost 1-0 at home to Leicester. 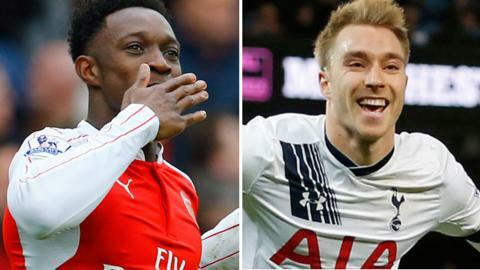 How big is that north London derby going to be when they face Arsenal at White Hart Lane on Saturday, 5 March? They still have to visit Liverpool and Chelsea along the way but no terrors for a team in this form. X Factor? Again similar to Leicester City. How will they cope with the hope and expectation of a fanbase that have not sampled a title since 1961? And how would they handle an injury to someone like Kane? Pochettino also carries weighty responsibility - but he looks such a safe pair of hands. Statistically speaking: Tottenham have won five consecutive Premier League games for the first time since a run of six in December 2011. Verdict: The rising anticipation among Spurs supporters that the long wait may finally be over is fully justified. This is a team that have lost only once away from home in the league this season, on the opening day at Manchester United, and look solid as a rock. This is as good a title chance as Spurs have had in recent memory. Form: Picking up - and it needed to. Arsenal had suffered an indifferent couple of results at home when they lost to Chelsea and were held to a goalless draw by Southampton. Arsene Wenger's side needed to answer back and they have done so with victory at Bournemouth and showing great persistence and character to break through Leicester's blue wall of defiance. It was required because old questions were being asked about the Gunners and their character. Now they can clear their heads and move forward. Momentum: Regained with these recent wins and must now be maintained through a couple of tough away fixtures on the horizon at Manchester United - always difficult despite their struggles - and that fixture of huge significance at Spurs. Wenger felt they passed a mental test against Leicester and there was a sense that the wind was back in their sails. X Factor? Same as ever - will the pressure of not winning a title since the season of 'The Invincibles' in 2003-04 engulf them, as it has seemed to do so often before? If they can conquer that, and come through those hazardous away fixtures unscathed, then supporters who have so often been disappointed by their team's title challenges in recent years can really believe. The calming influence of keeper Petr Cech, a four-time title winner at Chelsea, cannot be underestimated. They must not lose him. Statistically speaking: Arsenal have kept five clean sheets in their last eight Premier League games. Verdict: Will never have a better chance to reclaim the title that has eluded them for 12 years. If they blow it the recriminations will be loud and long. Form: Bad. It's been a desperate eight days for Manuel Pellegrini's side. Two home defeats by title rivals Leicester and Spurs have left them off the pace and struggling to regain the title they have won twice in recent years. It is made all the more frustrating by the fact this is a team full of talent who too often look off the pace - and are clearly capable of better. They do, however, have the capability to string together a winning sequence and this may yet be their saving grace. One telling factor should be a cause for concern. In five games against the other teams around them in the top four, they have only gained one point from an away draw at Leicester. Momentum: Currently being lost - but this team are so enigmatic it can be regained just as quickly. They would have expected six points from these two important home games. To come away empty-handed is simply not good enough. City still have to visit Chelsea and Liverpool and have a home derby with Manchester United on 20 March - and there could yet be a defining meeting with Arsenal at the Etihad on Saturday, 7 May. First, however, they will have to make sure they are still in the race. X Factor? Has the confirmation of Pep Guardiola's arrival next season had an impact on Manchester City's players? The feeling here is that it has not but he will certainly cast a shadow if they continue to lose games. They have lost both since that appointment was rubber-stamped. City also have a heavy programme to deal with, with an FA Cup fifth round tie at Chelsea next Sunday followed by a Champions League last 16 game against Dynamo Kiev in Ukraine - with the matter of a Capital One Cup final against Liverpool at Wembley to consider at the end of February. Statistically speaking: Manchester City have won just one of their 10 Premier League games against sides currently in the top eight this season, losing six and drawing three. Verdict: City have now pushed themselves into the position of title outsiders with these two losses and for a team with so many outstanding players they too often look uninspired and short of drive and energy. Still capable of winning the title - but chances are receding on current evidence.